Duration: 18 min. per ep. Two Ghibli created shorts about the happenings in a fictional animation studio, presumably based to some extent on their own. The first was aired during a TV special about Ghibli, the second shown in theatres alongside 'The Cat Returns'. Note that the animation studio in these shorts is not spelled ジブリ (hepburn: 'jiburi'), but ギブリ (hepburn: 'giburi'), so pronounced with the hard 'gi' of 'give' rather than the 'ji' of 'jigsaw' used for Ghibli. 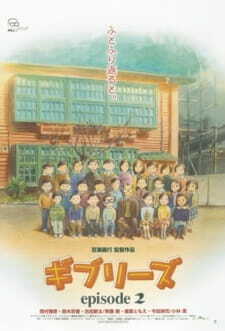 Ghiblies is a two part short made by, guess who, Studio Ghibli. It tells the story of a animation company doing well, their jobs. Sort of. What we have here is a quick and extremely enjoyable project by Studio Ghibli in which they poke fun at themselves. It's light on story, in fact there hardly even is one, but what you get is still very nice. The art is impressive (especially in the second episode) and the sound does its job just fine. It's hard to describe Ghiblies. Technically it isn't the best, but you can feel the joy the creators had making while watching. If you are a fan of Ghibli, or animation in general, I highly recommend finding Ghiblies and giving it a shot. -plot: was very accurate to some regard. Seeing how they were basing this on what they do for a living the slight clips of real events (non drawings) boosted the vibe they were going for. -comedy: in some slim cases i was able to chuckle. -plot: is jumbled some of the time. -plot: in some rare moments they would not press forward. Always had to look in the past. Ending remark: Nice starting animation piece for kids. For adult we have seen a lot so this basic form wont be as enjoyed unless we saw it growing up.